Though the semester is just beginning, the Yale Undergraduate Rover Association (YURA) has already been seen experimenting on science hill, laser cutting, and performing tests in the CEID. The team competed against 20 other schools at the University Rover Challenge last May, and after a strong start plans to go back again this year with a revamped arm, wheels, chassis, and soil sampling system. The competition involves four different tasks: soil sampling, equipment servicing, astronaut assistance, and terrain traversal. The team will be using the same suspension system as last year, having found that their rocker bogie frame was perfect for traversing the Mars-like terrain of Utah. They have, however, completely changed the rover’s arm design. This year the team will be using linear actuators instead of pullers. Team member and mechanical engineering major Pat Wilczynski (’16) likened the design to that of an excavator arm. 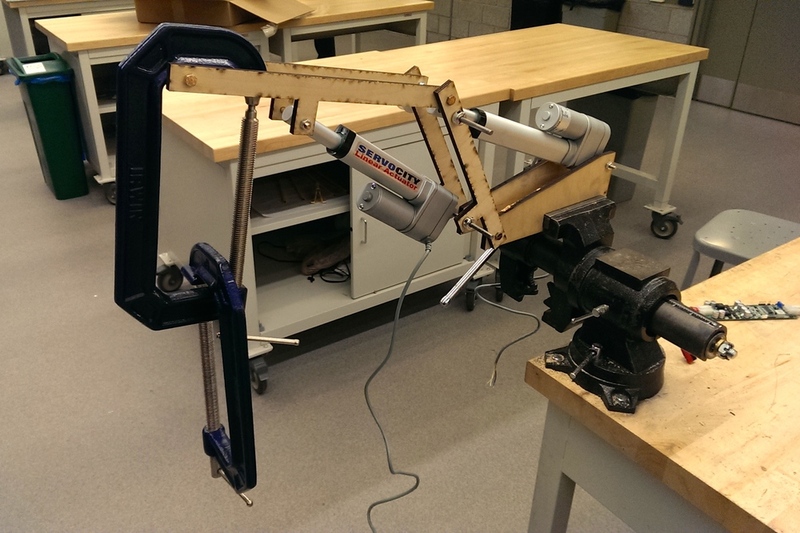 Wilczynski has been performing tests on the fully constructed prototype arm and has found that it can lift 5.5 kg, exceeding the goal of 5 kg. Though this arm is made of laser cut acrylic, the final design will be machined and made of metal. The team also recently received what is essentially a giant wifi router, which has a range of approximately 5-10 km according to last weekend’s test. Last year, Brian Clark (’16) and Ashton Wackym (’16) started up YURA with the goal of competing at the University Rover Challenge. Having accomplished this goal, the club is still going strong. If you are interested in learning more about YURA’s exciting work, check out their website or come to one of their weekly team meetings on Tuesdays at 7pm in the CEID.